THE STORY - Woody (Tom Hanks), a good-hearted cowboy doll who belongs to a young boy named Andy (John Morris), sees his position as Andy's favorite toy jeopardized when his parents buy him a Buzz Lightyear (Tim Allen) action figure. Even worse, the arrogant Buzz thinks he's a real spaceman on a mission to return to his home planet. When Andy's family moves to a new house, Woody and Buzz must escape the clutches of maladjusted neighbor Sid Phillips (Erik von Detten) and reunite with their boy. ​There are very few films which change the course of cinema history. In 1995, the magicians over at Pixar created their first film and the first ever computer animated film. It's safe to say that outside of some mind-blowing special effects in live action films, nobody had ever seen anything like "Toy Story." 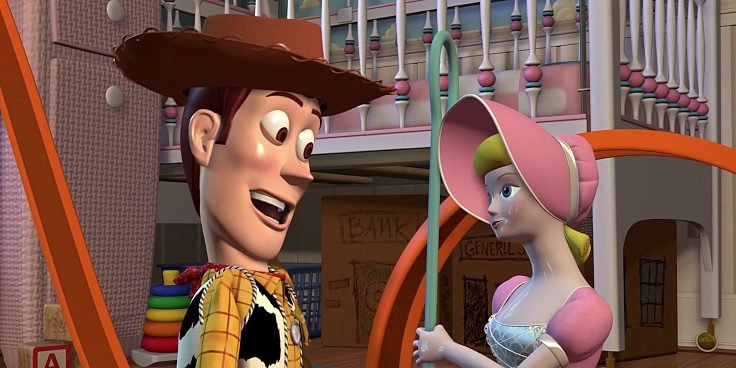 And although the animation has been improved upon in the 20 plus years since then, "Toy Story" continues to hold up extremely well due to its unique concept, heartfelt story, and perfectly cast voice acting. Andy is a young kid who owns a particular set of toys. His favorite is his cowboy doll with a talking pull string named Woody (Tom Hanks). He also owns other classic toys such as a Mr. Potatoe Head (Don Rickles), a slinky dog named Slinky (Jim Varney), a green tyrannosaurus rex named Rex (Wallace Shawn), a pink piggy bank named Ham (John Ratzenberger), and others. When Andy is not in his room, the toys come alive and hold regular meetings on major human events which will have an impact on them such as moving and welcoming new toys into their culture via Andy's birthday party. On his latest birthday, Andy receives a cool new spaceman doll called Buzz Lightyear (Tim Allen). The problem is that Buzz believes himself to be an actual space ranger instead of an inanimate object who's sole function in life is to make his owner Andy happy during these young years of his life. This confused frustration coupled along with the jealousy of being replaced as Andy's favorite toy pushes Woody to take drastic action against the new space toy. This sets off a chain of events which will place them into a journey outside of Andy's room, forcing the toys to put aside their differences and work together to get back to Andy in time before the family and the rest of the toys move to a new home. It's not only nostalgic to go back and re-watch "Toy Story," but its power lies in its ability to also make the audience members feel nostalgic of their early childhood playing with their own toys. It goes without saying that "Toy Story" would not have been as successful as it was if it were not for the broad audience appeal within the film's witty and insightful screenplay. The comedy banter between Woody, Buzz, and all of the other toys, continues to make both children and adults smile with joy while providing deep thematic resonance for adults on friendship and parenting. One of the phrases which represents this theme is said by Woody early on in the film as he states, "It doesn't matter how much we're played with. What matters is that we're here for Andy when he needs it." It's easy advice for Woody to say when he is Andy's favorite toy. But when Woody is tested with the Buzz Lightyear character, it provides the central conflict of the film which keeps us invested in the characters and has us howling with laughter every tiny step of the way along the toy's journey. Where Pixar struck gold, however, was in the casting of Tom Hanks as Woody and Tim Allen as Buzz Lightyear. In the film, the two characters are in complete contrast of one another, representing a bygone era of cowboy vs. spacemen, old vs. new, and Hanks and Allen sell that contrast in both of their vocal deliveries. Hanks is loud, wild, and energetic as the flimsy cowboy doll Woody. Tim Allen brings a smooth tough guy swagger to Buzz which instantly makes him the "cooler toy" when he is introduced to the world of Andy's room. While the human actor's animation and voice performances can't reach the same levels as the toy characters themselves (But was improved upon in the sequels), they still work in service to the story. Whether it's the first time you've heard Randy Newman's now-classic score and tune "You've Got A Friend In Me," or the thousandth, "Toy Story" is that type of film where no matter how much time has passed, or how many imitators there have been, the original still holds up. The energy and pacing of the film is off the page and never falters in concentrating on the story at hand through its characters. Most films would be so lucky to cram in two hours as much story and characterization as this film can in its brisk 81 minutes running time. Perhaps that is why the film is called "Toy Story." It is a story about the toys in one particular kid's life and their mission to be there for him no matter what, but the geniuses over at Pixar never lose focus of that story, not once. It provides a timeless classic which will continue to delight and inspire audiences "to infinity and beyond."